Gold Rush #1 is coming up! Win your seat now! 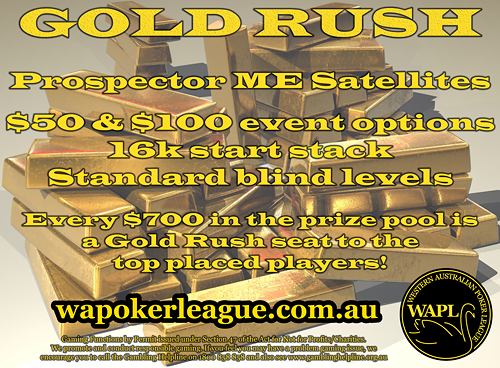 Here's your chance to win your way directly into the Gold Rush Main Event in 2018! You want one of these 32 seats! $50 Gold Rush Prospector - 16,000 start stack, standard blind levels. $100 Gold Rush Prospector - 16,000 start stack, standard blind levels. The Main Event Qualifier pays out $700 Gold Rush Main Event seats to the top ranked players, and stops when all available seats have been won. This is the best way to get into the Gold Rush Main Event, where the top 4 places (from just a 32 player tournament) win their share of the massive $20,000 cash prize pool!